The high altitude winds which circulate around the South Pole during December and January carry the payload in a broad circle around the vicinity of 77 degrees south latitude. The journey takes about two weeks, and the winds return the payload in the vicinity of McMurdo Station. The assembled gondola being carried out of the high bay on the Delta launch vehicle. The Boomerang Helium 3 fridge and focal plane insert. A close up view of the focal plane, looking at the photometers. The Boomerang focal plane, showing the row of four 150 GHz Polarization Sensitive Bolometers. 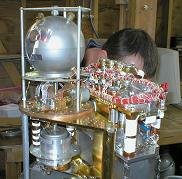 A photograph of one of Boomerang's polarization sensitive bolometers. The frame is about 8mm on a side, and the mesh is coated with an absorbing film in such a way as to preferentially absorb one sense of polarization. The 145 GHz (9.5') and 245 GHz (6') beams as measured in the field, prior to flight. The region of sky surveyed by Boomerang 2002. The colored swath through the image is the Galactic plane, and the field mapped by Boomerang is outlined in black. The empty areas we observe provide our cleanest view of the CMB, while our coverage of the Galactic plane will provide us information about the workings of our home galaxy. Boomerang is a balloon-borne instrument which images the Microwave Background Radiation in three bands, or colors, at wavelengths of about one millimeter. This is a much longer wavelength of light than our eyes can see, but a much shorter wavelength than the light used by microwave ovens, or by your radio. The signal from the CMB anisotropies peaks at 1.4 millimeters (213 GHz), while the emission of Galactic sources, dust, and our atmosphere is relatively small in the vicinity of two millimeters. Both the atmosphere and Galactic emission get brighter at shorter wavelengths, while the signal from the CMB starts to decline rather sharply. In order to maximize our sensitivity to the CMB while being able to distinguish the foreground emission we have chosen our three bands to be centered at 2.1, 1.2 and 1 millimeter (145, 245 and 345 GHz). A 1.2 meter mirror focuses the light from the sky onto the eight horns located in the focal plane of the telescope. Four of those horns couple the radiation to Polarization Sensitive Bolometers, which operate at 2.1 millimeters and detect both senses of linear polarization, while the other four horns feed photometers which split a single polarization into two bands centered at wavelengths of 1.2 and 1 millimeter. All of the sensors are cryogenic bolometers. The term cryogenic means that we cool our detectors to very low temperatures - in fact, we cool our entire focal plane down to 0.27 Kelvin, which is nearly negative 459 degrees Fahrenheit. Our cryogenic system keeps our focal plane cold for about two weeks as we make our observations. Bolometers are a very sensitive type of thermal detector. As we slowly scan the telescope across the sky, the temperature of the detector fluctuates in response to the variation in the intensity of the light. This temperature variation is measured by means of an extremely sensitive thermometer. The payload is launched from a site not far from McMurdo Station, Antarctica, and is carried to an altitude of 42 kilometers (26 miles, or 120,000 feet) by a helium filled balloon the size of a football stadium. At this altitude there is very little emission or absorption from the atmosphere, which can obscure the view of millimeter-wave telescopes and cause relatively large background loading on the detectors. The only reason we come so far to fly our telescope is because of the unique high altitude wind patterns which circulate around the South Pole. Once these patterns set up, a balloon launched from the edge of the continent will return close to where it began after a flight of ten to fourteen days. The more time it stays aloft, the more data we get, so the longer the better. We are unable to transmit all of the data back to the ground during the flight, so we need to physically retrieve the data storage vessel which is on the gondola. Therefore, it is very important that the instrument does not land in the ocean or in terrain which is too harsh to recover. By flying from Antarctica, we are able to have a long flight, with a fair chance at recovery. The Boomerang telescope is an off axis Gregorian system consisting of an ambient temperature 1.3 meter primary and cooled (2K) secondary and tertiary mirrors. The tertiary is illuminated by an eight element array consisting of profiled corrugated feed horns. The 145 GHz feeds are single moded, while the photometer feeds are single moded only at 245 GHz. The 345 GHz band is operated ~20% above the single moded regime in order to increase the throughput. For all frequencies, the main lobe is well described by a 2D Gaussian. The pixels are arranged in two rows of four along the scan direction, and are separated in azimuth by 30 arcminutes. A polarizing grid is fixed to the aperture of the photometer feeds (245 GHz and 345 GHz) to provide sensitivity to a single linear polarization. Each of the 145 GHz Polarization Sensitive Bolometers (astro-ph/0209132) are sensitive to the sum and difference of two orthogonal linear polarizations. The axis of sensitivity of each of the pixels is rotated by 22.5 degrees to allow the separation of the I, Q and U Stokes parameters. Boomerang's scan strategy will encompass overlapping "shallow" and "deep" fields, which will allow the measurement to probe a broad range of angular scales with high signal to noise. In addition, Boomerang will survey a broad swath of Galactic emission allowing the study of the polarized emission at high, intermediate, and low Galactic latitudes. 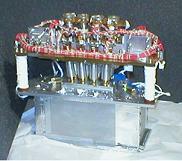 Several compact sources will be observed as well, for the purpose of calibrating the beams of the instrument. Pointing reconstruction is achieved through the combination of a pointed star camera, a pointed Sun sensor, a fixed Sun sensor, 3 orthogonal axis rate gyros, and a differential GPS array.